Visit the amazing Moscow Kremlin on this 1.5-hour, small-group historical tour in the city center! See the magnificent former residences of Russian tsars and glimpse the façade of the Senate Palace, where the current president holds office. Learn about the fascinating history of the beautiful castle-like fortress, as well as the Russian state and Russian Orthodox Church as you tour the grounds, cathedrals and monuments with an informative guide. 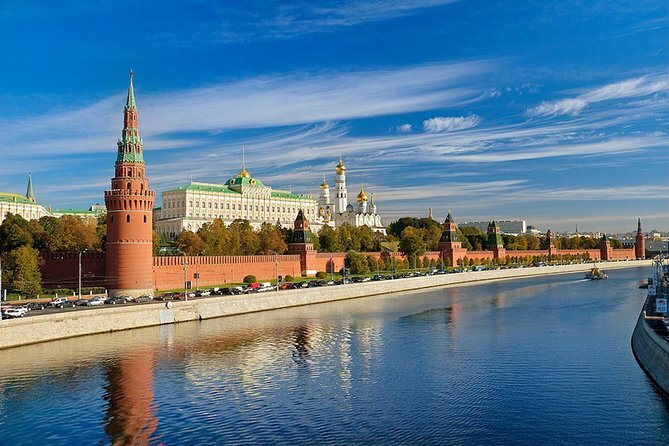 Meet your guide at Kutafia Tower at the Kremlin and get ready for an informative small-group tour. Envision the grandeur of the Grand Kremlin Palace and walk around its central courtyard, visiting monuments and cathedrals. In Ivan Square, see the popular Tsar Bell, the world’s largest at 20 feet (6 meters) tall. Made of bronze and adorned with portraits of Tsar Alexei and Empress Anna, the bell broke during casting and was never repaired. Check out the 16th-century Tsar Cannon, one of the largest ever made at almost 20 feet (6 meters) long. From here, view the southern exterior façade of the Senate Palace, which currently houses the Russian presidential administration. In Cathedral Square, visit the 15th-century Assumption Cathedral, once the main church of Russia and the place of coronation for all Russian tsars and emperors, and view Archangel Cathedral, once a burial place for Moscow’s imperial kingdom. Gaze up at Ivan the Great Bell Tower, reaching a height of 266 feet (81 meters) and topped with a golden dome and 23-foot (7-meter) high cross. Your small-group tour ends at Borovitskaya Tower, where you can continue to visit other cathedrals of the Kremlin on your own. It was a really interesting tour, and we enjoyed the visit. The tour guide was very attentive to the needs of the group, and explained the buildings and historical significance of the kremlin in very good detail. A good way to experience the Kremlin in a few hours. Guide was very informative and enthusiastic about what she was telling and showing us. Recommend tour to anyone. This is all you need! Once you're in, you get the guided tour and afterwards, you're free to wander about! Just what I expected. Guide was great! Our tour guide Elena was very knowledgeble about the Kremlin history. The guide did a nice job of explaining the historical importance of the buildings inside the Kremlin and of Russian culture. But for a 90 minute tour, a 45 minute wait to get in was a bit much and unexpected. The extra time put us 45 minutes behind on our schdule for the rest of the day.